The earthquake in Nepal that triggered tremors across the entire sub-Himalayan belt and plains of north and east India a little before noon on Saturday left at least two dead and over 40 injured in north Bengal. The rest of the state also felt the jitters. Civic polls being held at 91 municipalities across the state stopped for around an hour following the earthquake and the termor thereafter. In Kolkata, people rushed out of highrises in panic and offices were evacuated, leading to traffic snarls in the central business district. Several buildings reported cracks in the aftermath of the earthquake. In north Bengal, one person died in Siliguri and another in Jalpaiguri while 40 were injured in a school collapse in Malda. A house collapsed in Siliguri town, the gateway to summer holiday destinations Darjeeling and Sikkim. Several buildings in the town on the foothills of the Himalayas were badly damaged in the quake. The death in Siliguri occured due to a wall collapse while that in Jalpaiguri was from heart attack triggered by fear. In Darjeeling town, the tremors led to panic among holidayers. Though no major damage was reported, many tourists cut their holiday short and scrambled for the plains. With warnings of more tremors in the aftermath of the earthquake, they weren't willing to take any chance. In Kolkata, skyscrapers that have sprung up in the past decade shook violently, forcing occupants out in the open. Though the quake measured a moderate 5 on the richter scale in Kolkata, it lasted for nearly two minutes, longer than in other earthquakes in recent memory, including the Sikkim earthquake in 2011. The prolonged tremours caused cracks to appear in many highrises in the metropolis, including a line of apartments located along the posh Southern Avenue locality. Fissures also appeared in flyovers and malls. Nepal earthquake hits 2 dead, 40 plus injured in North Bengal - one person died in Siliguri and another in Jalpaiguri while 40 were injured in a school collapse in Malda. 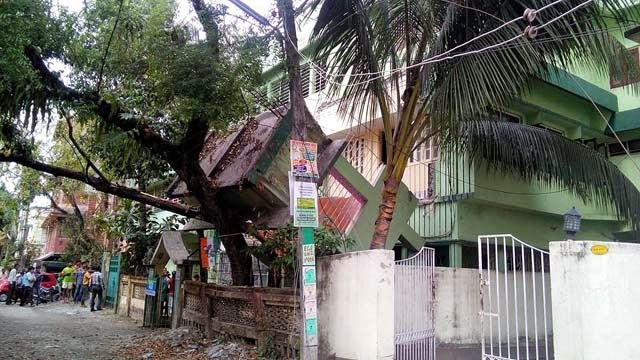 A house collapsed in Siliguri town, the gateway to summer holiday destinations Darjeeling and Sikkim.